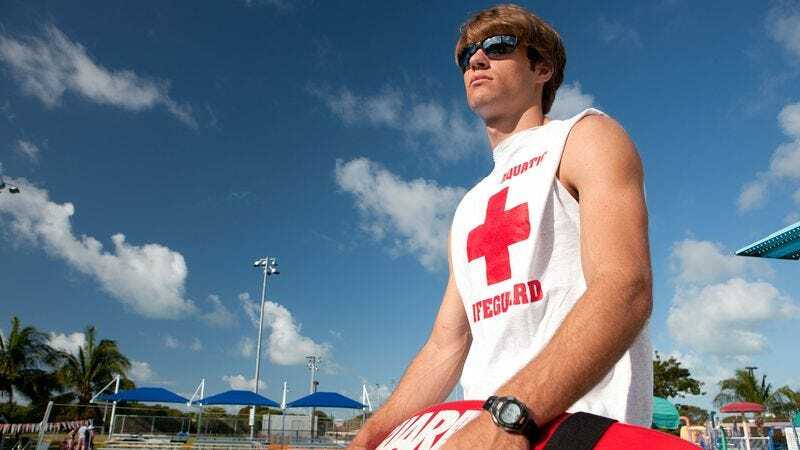 Lifeguard Would Save Drowning Man, But Who Is He To Play God? BALTIMORE—Reluctant to transcend his station as a mere mortal and interfere with the vicissitudes of fortune, local lifeguard Blake Dunphy confided to reporters Tuesday that he found himself mentally shackled by the question of whether to save a swimmer currently thrashing for his life or allow destiny to take its course unfettered. “Though this man sputters and flails before my eyes and the path to his salvation lies readily before me, the broader question remains: Who am I, a mere earthly being of flesh and blood, to determine whether my fellow man lives or dies?” Dunphy mused, wondering if it was not, ultimately, the hand of fate that placed an inexperienced swimmer in the deep end in the first place. “Surely a decision of such existential import rests solely on the shoulders of an all-knowing, all-seeing god, which I certainly can’t in good conscience pretend to be. Furthermore, can it even be stated that I—or any being subject to divine decree—actually possess the free will to impel myself from this chair and rescue another, or are all such outcomes preordained by the stars themselves?” At press time, Dunphy was saved from the burden of choice by a mid-afternoon shift change.